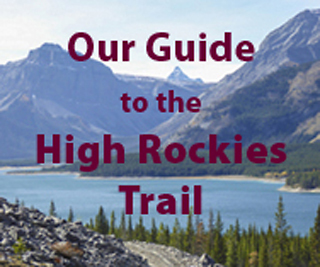 So, where are the best larches in Kananaskis Country. There are many old favourites— Burstal Pass, Pocaterra Cirque, Chester Lake — but there are many others. Here is our selection of some of the best larch hikes. Arethusa Cirque – much better than neighbouring Ptarmigan Cirque and only a 5 km round trip. Rummel Lake – likely to be less crowded than Chester Lake. Has a fine display of larches. Tryst Lake — the lake may have drained away but the larches here are spectacular. South Mist Hills — these hills at the south end of Mist Ridge are a worthy objective, though little more strenuous than the previous hikes. Piggy Plus Col — different? Not in the guidebook but follow the links for details. Read’s Tower’s backside. Don’t climb the tower. Just as the actual tower climb starts, cut left and head towards the Sparrowhawk ascent. The gully is larchland. Tent Ridge… no. The basin below the ridge is good, the slopes of Tent is. But the ridgewalk is above the treeline and not Odlum-like walking in a larch forest. Pocaterra Ridge… no. Grizzly Col-ish and Pocaterra Tarn, yes. But the ridge is above treeline, and not walking in the larches, whereas the access route to the start of the ridge is good. I’ve now been up both Running Rain Ridges and… not great. There are some, but not many. Odlum Ridge and the two ridges on either side of Running Rain Creek. All three are on the west side of Highway #40 in the Highroad Valley. Were on Rummel Ridge a few days ago (up from Rummel Lake and down the snowshoe route). What a viewpoint for larches! They were everywhere. Most notably Tent Ridge which is easy to get to and Commonwealth Ridge above Commonwealth Lake which requires a bushwhack from the Commonwealth Lake trail. And on all the low ridges between Rummel and Chester lakes, and on Rummel Ridge itself and in the little valley behind it. One of my favourites is Mt. Allan / Nakiska. There is a great swath of larches that stretches from the top of the 1988 Olympic Womens Downhill to the top of the Gold Chair, all the way around the upper basin of Twin Creeks and Marmot Creek. Another fabulous larch area is around Lake Rae, in the Elbow/Sheep headwaters.